One of the strangest investigations ever! Definitely the most unique interrogation you’ve ever read. An informant takes Chief Sam Jenkins and Sergeant Stan Rose to a partially buried corpse in a forest clearing once used by marijuana growers. At the crime scene, the medical examiner states a fact and makes a conjecture. The victim was killed elsewhere and the killer may be a vampire. 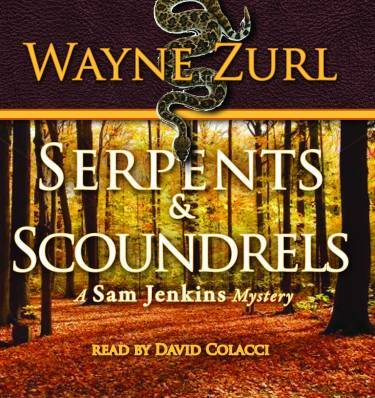 The investigation leads to a religious con man, snake handling fundamentalists, and a beautiful woman scorned. Only Jenkins’ singular style of detective work develops a way to arrest the murderer. Sequel to BY THE HORNS OF A COW. At 7:45 Sergeant Stanley Rose and I sat in my unmarked Crown Victoria parked in a lonely clearing in the hinterlands of Prospect. Once the hideout of moonshiners, that wooded area changed its economic use from untaxed liquor to a different cash crop until the DEA busted up a lucrative marijuana growing business. After the pot disappeared, the desolate woodland, connected by makeshift trails, accommodated clandestine lovers and the occasional thief needing privacy. And then it became a place for me to meet informants. “Wonder what John Deere has this time?” Stan asked. Stanley is six-four. Few creatures would dare to bite him. “I think our boy is heading this way,” Stan said. A solitary figure suddenly appeared on the trail no more than a hundred feet from where we sat. John Deere, as we called him, appeared to be in his forties, of medium height and build. The bright green and yellow baseball cap with the tractor manufacturer’s logo sat on his head. His wardrobe consisted of a plaid short-sleeve shirt and blue denim overalls. We got out of the car and met him in the middle of the trail. “Howdy,” I said, trying to embrace the local culture. Stanley nodded to him. “Whatcha say?” he responded and waited. He turned and walked down the trail. Stan and I followed. When we reached the narrow gravel road he turned right. The daylight began fading, but even under the forest canopy, enough light filtered through for us to follow him without using our flashlights. A few minutes walk put us in a clearing ten times larger than the one we left. In the upper left corner of the circular clearing I saw a pile of hastily mounded leaves. We walked closer. Poking out from the bottom of the leaves, I noticed a two-tone brown cowboy boot. Both our flashlights probed the pile of leaves. Directly opposite the boot I saw a hand. I turned my light to where our informant last stood. He was gone. We didn’t disturb much of the scene and it didn’t take long for us to learn that the man under the mulch was dead. Stan called it in, requesting a county crime scene unit and a medical examiner. He arranged for Officer Will Sparks to meet them both on the main road near the Prospect Air Park and guide them into the clearing. Crime Scene Investigators Jackie Shuman and David Sparks, Will’s cousin, set up enough portable lighting to illuminate a night baseball game. They puttered around processing and photographing the crime scene while Stan and I looked on with interest. The on-call pathologist, Dr. Morris Rappaport and his assistant Earl Ogle, represented the ME. “I don’t mean to be either didactic or pedantic–or facetious, for that matter, but how many homicides have you investigated, Sam, both here and back in New York?” The doctor spoke with a New Jersey accent. “Ah, a couple of days–bingo, that would be my guess, too. I’ll only know more after the autopsy. The doctor stared at me with a smug look. Earl frowned, perhaps wondering if Morris had been serious, and Stan shook his head, probably wishing he’d taken a vacation day.